Cool Seal™ Stick Capsule. 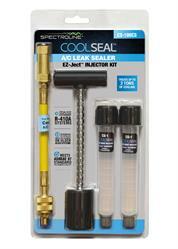 Add Cool Seal A/C Leak Sealer and refrigerant in one simple step.1 Capsule treats up to 2 tons of cooling. Requires bleed valves for injection (BV-50). CS-3CS Capsule treats up to 2 tons of cooling. 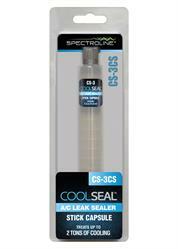 Cool Seal Seals pesky leaks in compressors, condensers, evaporators, O-rings and hoses. Can add years to older, out-of-warranty AC&R systems that leak small amounts of refrigerant. Works with all popular refrigerants and oils. - Non-polymer, oil-soluble formula safe for system components and recovery equipment - Remains safely in system to help protect against future leaks - Can be injected with system off or running - NOW available in THREE convenient delivery methods including Cool Stick. WESTBURY, NY--(Marketwired - May 09, 2016) - Spectroline's Cool Seal™ A/C Leak Sealer is the hassle-free way to add years to out of warranty AC&R systems. Cool Seal seals refrigerant leaks in compressors, condensers, evaporators, O-rings and hoses. And it's now available in three popular delivery methods. The new kid on the block is the Cool Seal Stick Capsule (CS-3CS). 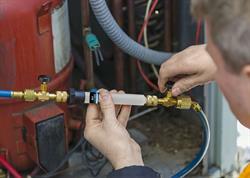 It allows Cool Seal to be injected right along with your refrigerant (2 bleed valves required). Each capsule treats up to 2 tons of cooling. The CS-100CS Cool Seal EZ-Ject™ Kit features the EZ-Ject™ injector assembly, hose/coupler with check valve and purge fitting and two cartridges prefilled with Cool Seal. Each cartridge treats up to 2 tons of cooling. The larger CS-2CS Cool Seal BigEZ™ Cartridge works with the BigEZ™ injector, but can also be used with the EZ-Ject injector using a special adapter. The full cartridge treats 6 to 12 tons of cooling. Regardless of the delivery method, Cool Seal remains safely in the system to guard against future leaks and is an economical alternative to expensive parts replacement on older AC&R systems. Unlike aerosol can-type leak sealers, Cool Seal is non-flammable and has no storage-related safety issues. There is no need for system pump down, and that allows the technician to see the contents injected into the system. Cool Seal meets ASHRAE 97 standard for chemical stability. Its non-polymer, oil-soluble formula is safe for all AC&R system components and recovery equipment. It works in all popular AC&R systems, including high-pressure R-410A systems. For more information, call toll-free 1-800-274-8888. Outside the U.S. and Canada, please call 516-333-4840 or check us out at Spectroline.com. Headquartered in Westbury, New York, Spectronics Corporation invented fluorescent leak detection in 1955, and remains the world's leading manufacturer of ultraviolet equipment and fluorescent dyes. Spectroline® cutting-edge, top-quality, industry-awarded lamps, dyes, radiometers and diagnostic tools are built to exacting standards, and are used for literally dozens of markets, some of which include Industrial, Air Conditioning & Refrigeration, Laboratory, Semiconductor, Nondestructive Testing and Forensics. Spectronics Corporation is dedicated to upholding high standards in design manufacturing, ensuring customer satisfaction and developing innovative technologies that make the world a better place.